Stop having a boring tuna, stop having a boring life. 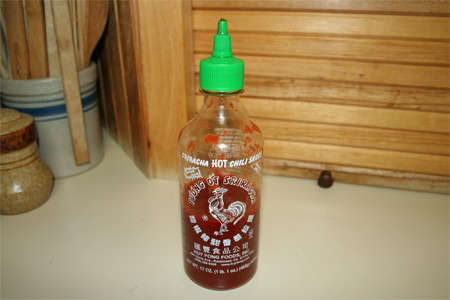 Don’t waste your money on a Slap Chop though, invest it in a bottle of Sriracha! Imagine ambrosia, the stuff Greek gods use to eat. Then imagine that those Greek gods were secretly Chinese gods. This is the stuff they would be eating! I don’t know how Huy Fong Foods did it (especially considering they obviously haven’t hired a marketing manager by the looks of 12 year old website), but they managed to capture the essence of Americanized-Chinese food. Anything you put this stuff on suddenly makes it seem like it came straight off a Chinese buffet. I never thought it would happen, but this afternoon I enjoyed a Chinese grilled cheese sandwich! Last night I had Chinese popcorn. I can’t quit eating this stuff, it’s incredible! Never before has a condiment captured my heart and imagination like Sriracha. I’m contemplating trying it on waffles in the morning, it’s seriously that good. I have absolutely no misgivings about rating this stuff as highly as possible. At only a couple of bucks at your local retailer or grocery store, there’s absolutely no reason not to have this stuff in your kitchen.